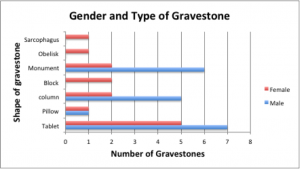 Based on the information that our team collected from the survey of the gravestones at Calvary cemetery, there is evidence of some differences in terms of gender. For instance, I decided to make a graph that would compare the number of deaths (per gender) every 30 years. Although our sample is relatively small (N=33), the overall trend shows interesting results. Between 1861-1890 and 1921-1950, we collected information from a total of 7 males that died during those periods but what’s interesting is that we didn’t collect any information from females during those periods (i.e. they were completely absent). Women are clearly underrepresented during those periods perhaps due to the fact that female population was smaller or our group failed to collect enough data from those sections. I also want to highlight the fact that between 1891-1920, the number of deaths per gender was very similar. likewise the most recent range of dates between 1981-2011 suggest that the population of male and female burials was more evenly distributed. 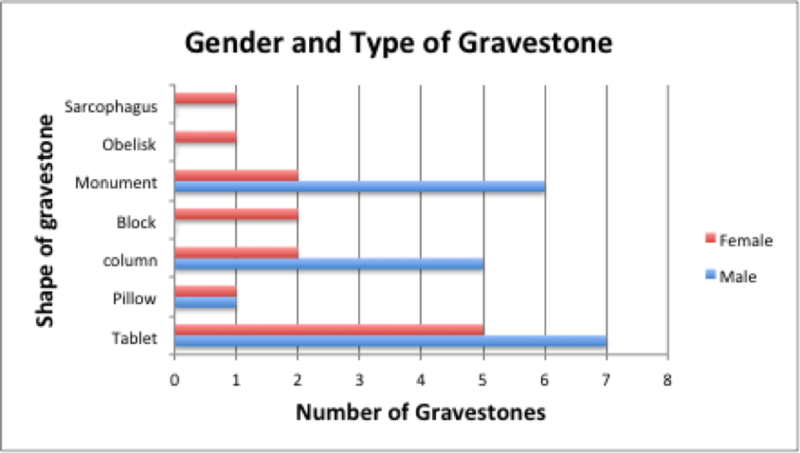 I also wanted to compare the different shapes of gravestones and see which types were more popular among males and females. For instance, “tablets” are the most common type of gravestone in our sample. The number of tablets used by males is slightly higher than those used by females (7 vs 5). Another interesting observation is that the number of “monuments” and “columns” used is significantly higher for males than females. This is important because the majority of columns and monuments are more elaborate (i.e. complex designs and made out of polished granite or marble). These types of gravestones also include more descriptive epitaphs because they tend to be larger in sizes. I think this could reflect some gender inequalities (e.g. more expensive and complex structures for males) however, we need larger samples in order to make such conclusion.